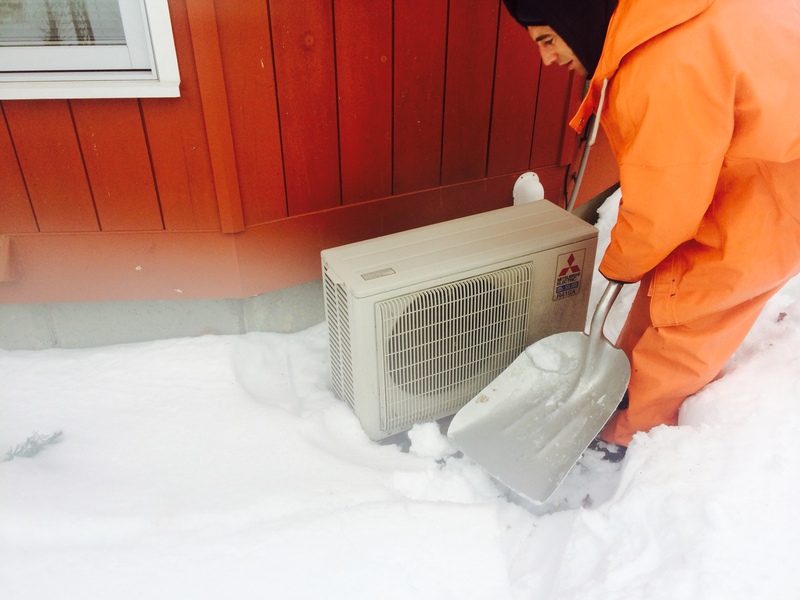 A blizzard (a severe snowstorm and sustained winds of over 35 mph) is a challenging weather condition for any heating system, even a mini-split heat pump. 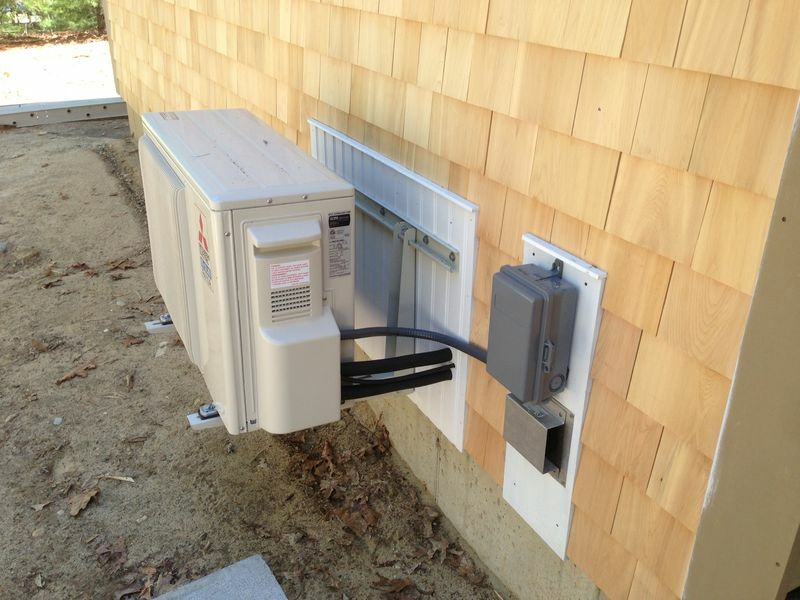 Recall how an air source heat pump works – the outdoor unit has a compressor and a fan that blows air across a coil with refrigerant. In heating mode, the coil is colder than the outdoor air. As air is drawn through the coil it gives up heat to the coil and leaves the other side colder. 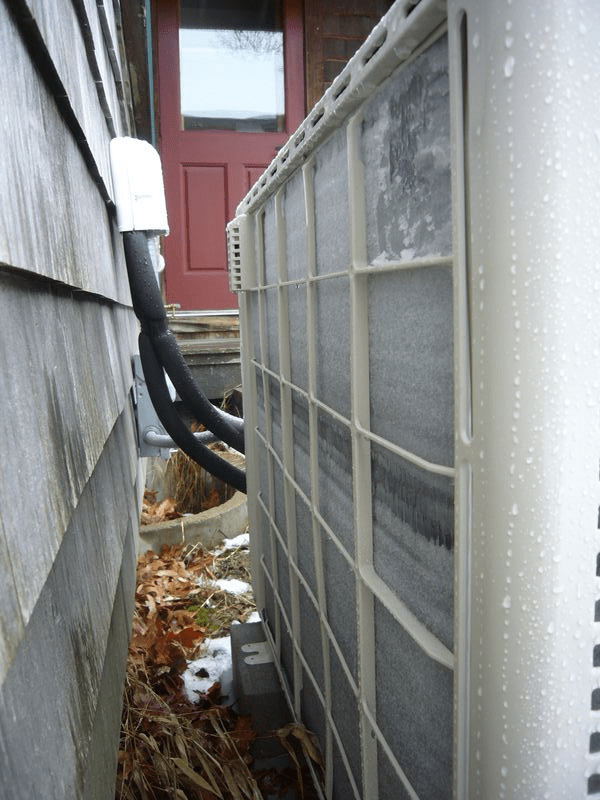 The more humid the air, the more condensation occurs on the coil. (Warmer air holds more moisture.) 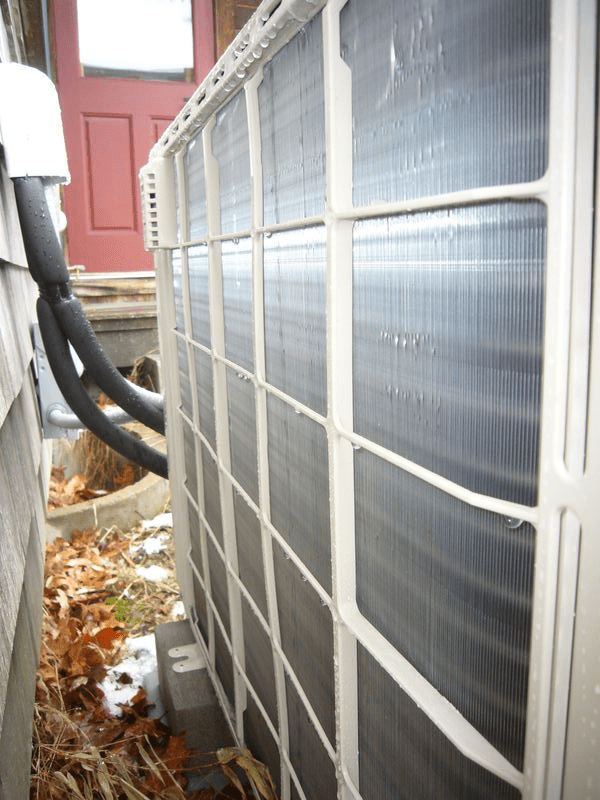 At temperatures at or below freezing, that condensation may freeze on the coil, reducing air flow through the coil and heat transfer to the refrigerant. 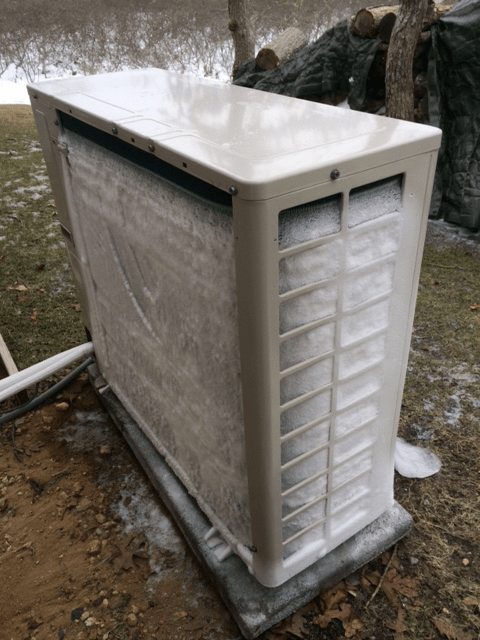 Heat pumps are designed to sense this type of condition, and periodically operate a defrost cycle, in which the heat pump reverses and uses some energy to melt the frost off the coils. Fujitsu condenser with frost building up. Here’s the same condenser after the defrost cycle. Here’s a Daikin condenser that I think has a faulty defrost cycle – the frost has built up considerably. Through about 2 pm, the temperatures were in the mid-to-upper 20Fs, and the defrost cycles, marked by the dips in power draw, occurred roughly every 4 hours, lasted 4-5 minutes, and drew under 250W. Once the storm starts up, temperatures are right around freezing, and the fine snow is being whipsawed around by the strong winds, which can drive the snow into the coil, coating it and triggering the defrost cycle. The blizzard becomes a moisture delivery system. The defrost cycles are much more frequent, slightly over once per hour. And the duration rises to 15 minutes or so, with a power draw of 500W. Note also that after the defrost cycle the heat pump power draw jumps up to 900W or so, whereas before the storm it’s running at 450W much of the time. It appears that the firmware drives the heat pump up to the higher power draw for a certain amount of time after every defrost cycle, and when the cycles are frequent, it never drops down to the “cruising” power draw. So both efficiency and capacity are reduced, because the energy going into defrost isn’t going into the house. You can tell when the defrost cycle occurs because the indoor fan shuts off, otherwise it would be blowing cold air. The condenser needs clearance beneath it, because the melt from the defrost cycle is going to freeze once it drips down off the condenser, and in the worst case it freezes under the condenser and crushes the lowest row of the coil and the unit is ruined. So it makes sense to raise the condenser above snow line and keep it under an overhang or roof. Condensation pan heaters are available to keep ice from building up in cold climates. However, these consume electricity and may not be appropriate for all cold weather applications. We’ve been pleased that these seem not to impart vibration to the house, the units must be very well-balanced. Does this mean that houses heated by mini-split heat pumps, with no back-up heating system, are more vulnerable in bad storms than houses heated by modern fossil fuel burning equipment? Not necessarily – those have their own issues in the storms. Sealed combustion sidewall vents can be plugged by ice or wind-driven snow, and wind gusts can cause the pressure sensing switch to shut the units down. So modern heating systems in general are more twitchy in severe weather than the old atmospherically vented boiler venting into an interior masonry chimney, with a barometric damper. Do we want to go back to that? For a number of reasons, I’d say no. Houses that need that big boiler or furnace are much more likely to freeze up when that unit goes down (say in a power outage) than a small superinsulated house with a mini-split. My sense is, get ’em up off the ground, and check them in a bad storm.